to try the one I’ve never tried before. Our most recent cruise was my first on Royal Caribbean. 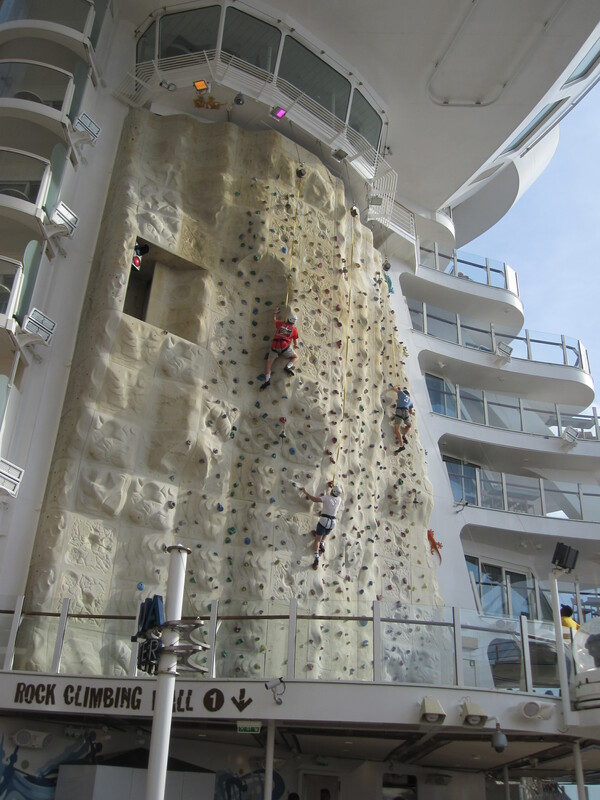 The ship offered many, many recreational activities on the ship and this would make an ideal vacation families with multiple age levels. But if you are traveling as a mature couple looking for quiet relaxation, you should choose another ship and cruise line. 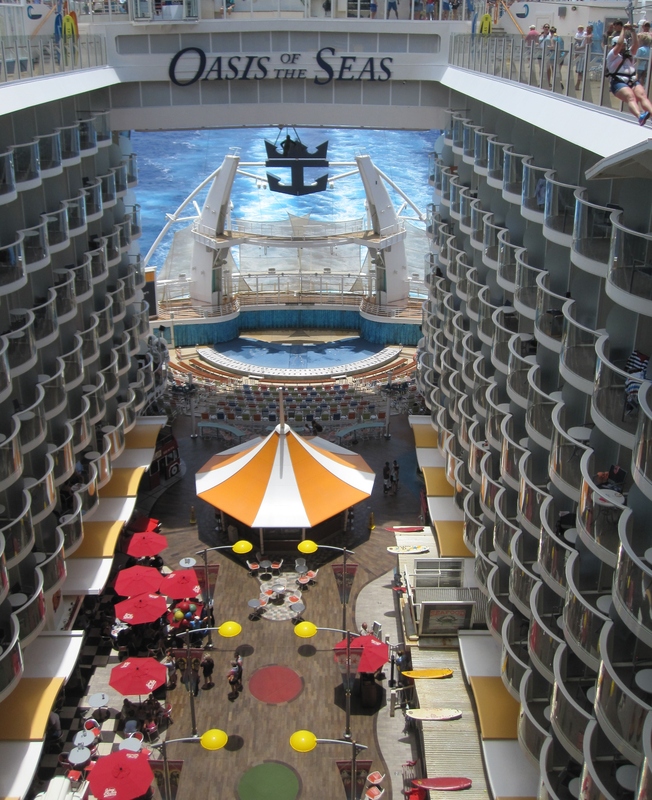 Oasis of the Seas and her twin sister Allure of the Seas are the biggest cruise ships at sea. A crew of 2,400 takes care of 5,500 guests (or more if every berth is filled). The designers have managed to dispel some of the sense of hugeness on the ship by organizing the public spaces into “neighborhoods.” There are two atriums open to the sky; inside these caverns are Central Park with restaurants and landscaped plantings, and the Boardwalk with a genuine carousel and seaside themed eateries and activities. The walls of each atrium are made up of balcony cabins. We had one of these interior balconies just two decks below the swimming pools. The pool deck noise and calypso music carried well into our cabin even with the door sealed. walls flank the zip line which traverses the open top of the Boardwalk. In all these places, there are serious instructors and spotters managing the equipment and the riders quite responsibly. The ice skating rink is hidden below decks in the entertainment neighborhood, not out in the Caribbean sun. Guests can borrow skates here for 45 minute skating sessions on some days. There are a sizeable miniature golf green and basketball court. The swimming deck has four pools plus hot tubs. There are very admirable areas for supervised children’s programs. Yes, there is plenty to do here! But not being an active sort myself, I got more enjoyment out of the “Broadway” production of Hairspray, the excellent skating show Frozen in Time, and the amazing diving and synchronized swimming show Oasis of Dreams in the Aqua Theater. Because there are so many passengers, it is important to book complimentary tickets for these performances. Pre-booking reservations in the specialty restaurants is also important, but the interactive in-cabin TV makes booking very easy. The attractive main dining rooms are huge but the tasty food is presented in a timely way. The best food, though, was served in the specialty restaurants which require a surcharge. The overall experience is like being in a combination shopping mall (I didn’t mention the Royal Promenade) and amusement park. 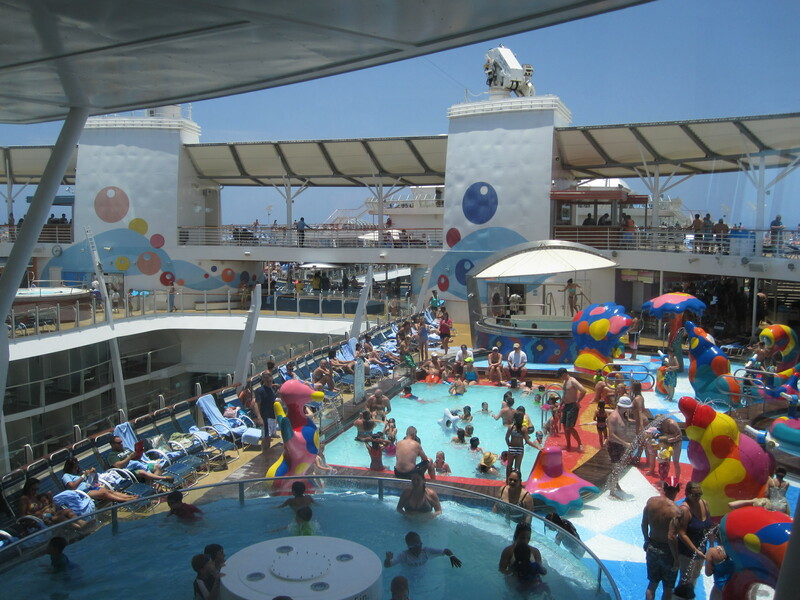 The cruise ports are unremarkable (Nassau, St. Thomas, and St. Martin/Maarten) and that suits most people because the OASIS is the destination they have come to experience. I was impressed by all that they did so well – but I personally would not go again unless I was traveling with a young and energetic extended family. Not all cruise lines are alike. Within a cruise line, not all ships are the same. It really pays to choose your cruise line, the ship, and of course the itinerary to suit what YOU want in a cruise. These are principles I have understood for years. Being on a ship which does not suit my preferences really brought the concepts to the forefront of my mind. I would be happy to help you select the perfect next cruise – or non-cruise. Call me! 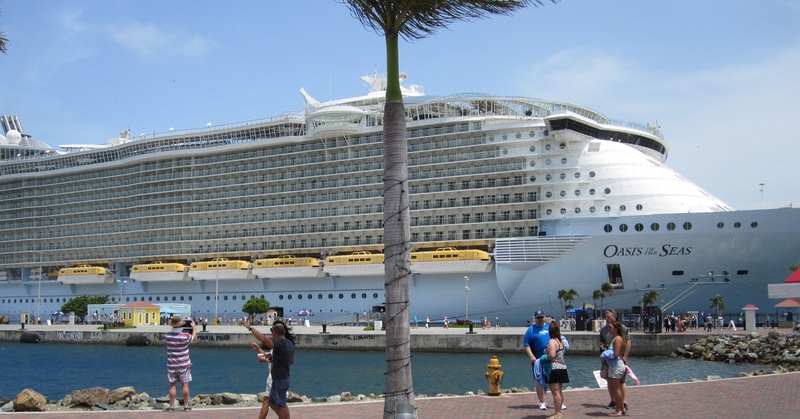 So — Why was I on the Oasis of the Seas if I would not have chosen this ship (or cruise line or itinerary)? As a Virtuoso travel agent, I was invited to learn about the ship and the cruise line first hand with other agents – at a very attractive rate. I have sold Royal Caribbean and heard the company’s presentations many times. But personal experience makes a huge difference in recommending with authority and confidence. 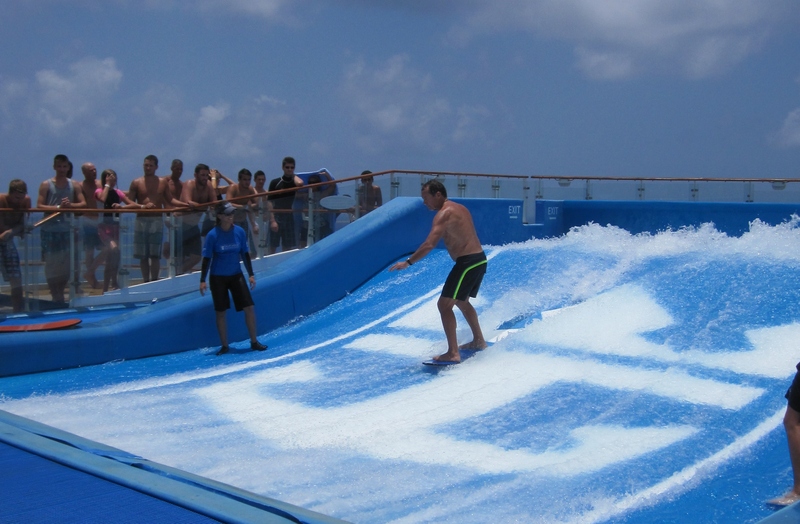 This entry was posted in Travel, Uncategorized and tagged active, Aqua theater, Boardwalk, Central Park, family vacation, Flow rider, Oasis of the Seas, Royal Caribbean Cruise line, travel, zip line. Bookmark the permalink.